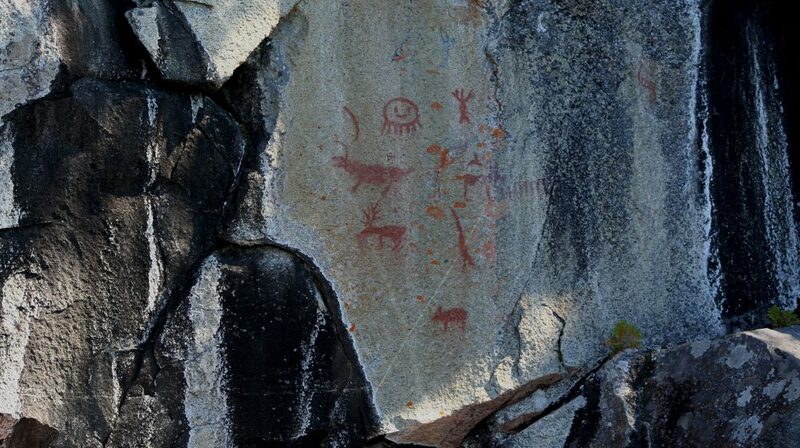 Sinclair Creek Site, British Columbia. On the left, an anthropomorph holding a hoop decorated with threads seems to be performing a dance in front of a horned figure (on the right) that holds a snake in its hand. 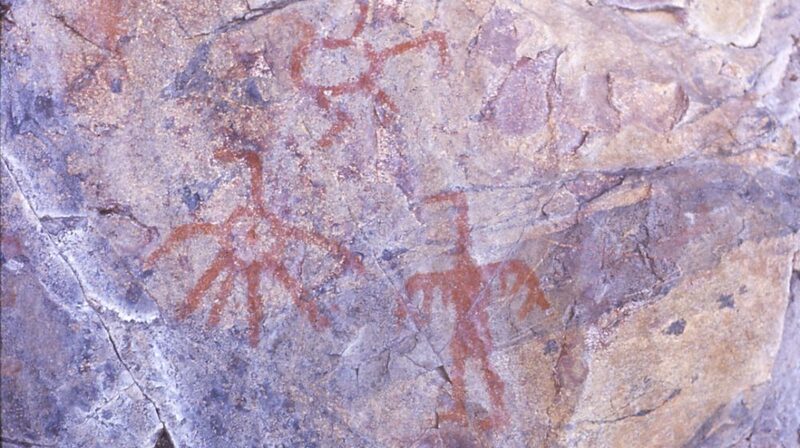 High Rock Narrows, Saskatchewan. 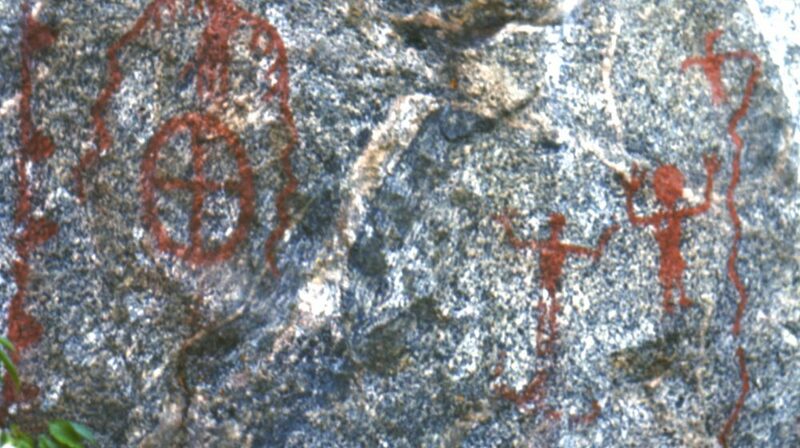 Several paintings, including a bird with long sinuous wings, two anthropomorphs with raised arms and a circle with a cross inside, are part of this complex group of images. Wasawakasik Lake, Saskatchewan. Two zoomorphs: a Thunderbird (bottom right) and a turtle (top right); between the two, a motif that looks like a schematized bird. Grassi Lake, Alberta. 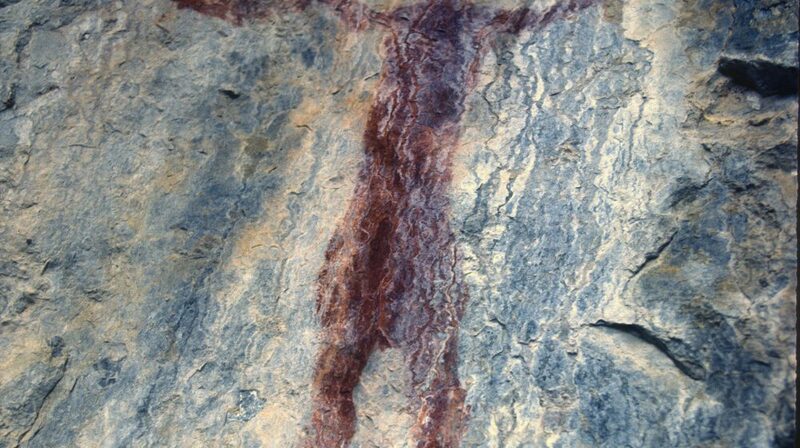 Rock painting of a human figure holding a circular object: a hoop, a drum or maybe a shield. Fairy Point, Ontario. 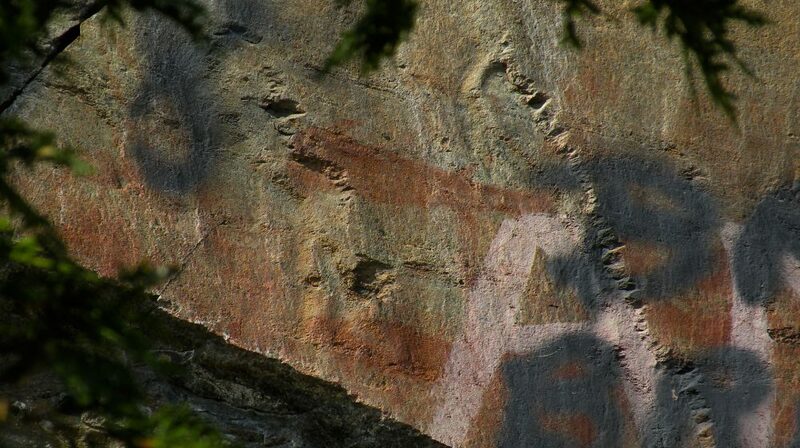 Several representations, including caribous, a bear and a face, are clearly visible on this cliff at Missinaibi Lake. Bedford Barrens, Nova Scotia. 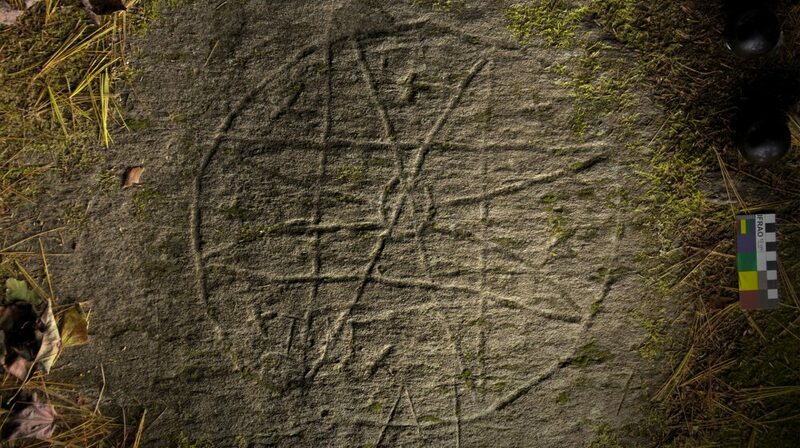 The 'Eight-Pointed Star' motif recorded at Bedford Barrens, near Halifax, Nova Scotia. 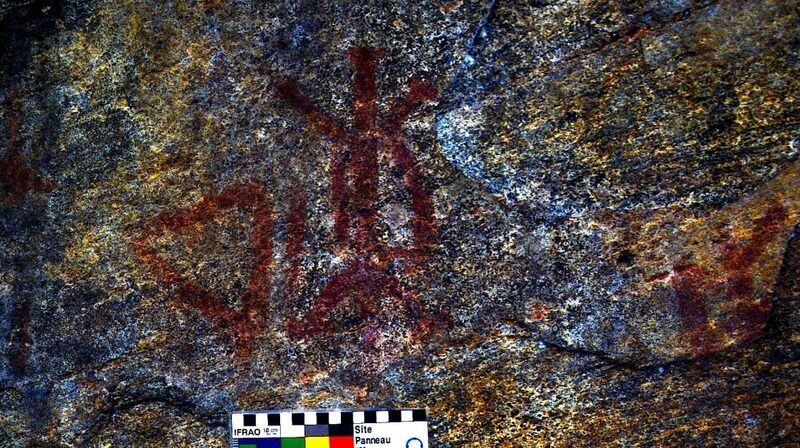 The Mi'kmaq petroglyph is illuminated using the Highlight-Reflectance Transformation Imaging technique. This method reveals design detail and manufacture tool marks indiscernible under daylight conditions. Agawa Bay, Ontario. 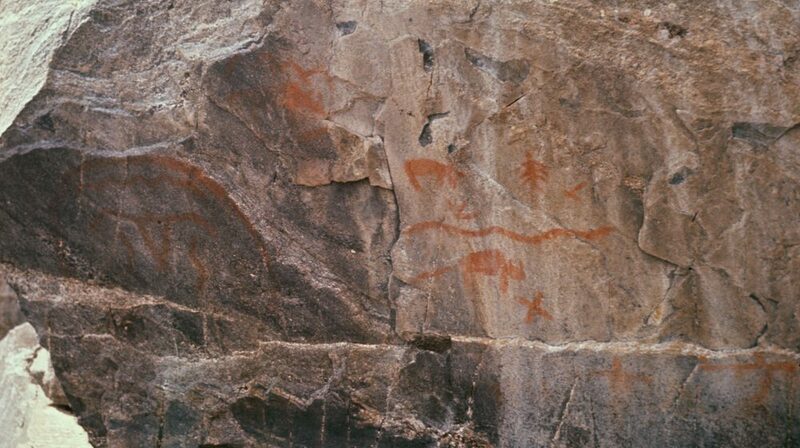 Rock paintings depicting a canoe and underwater creatures, Mishipeshu, or Great Lynx, and snakes. Wakimika Lake, Ontario. 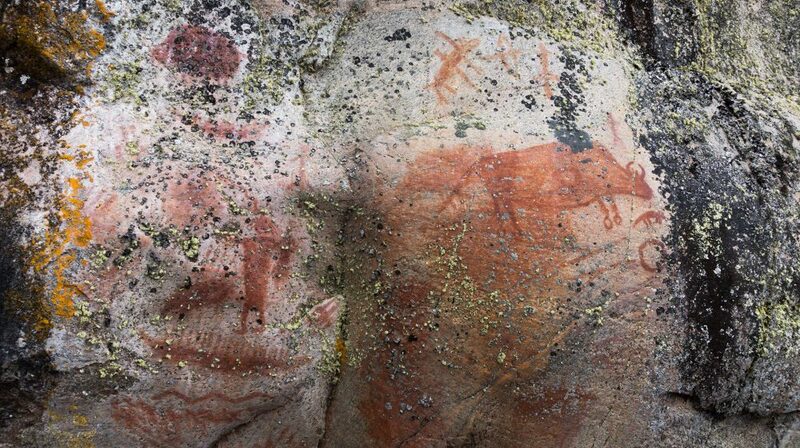 One of the very few petroglyph sites of the Canadian Shield, with a male moose standing out among the carved figures. Stanley Rapids, Saskatchewan. 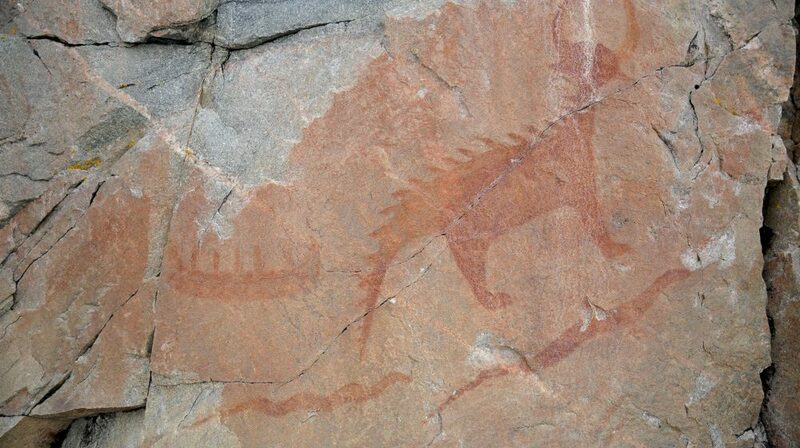 Images of bison, a stylized bird and wavy snake-like figures are part of the rich visual repertoire of this site on the Churchill River. Nipigon River, Ontario. 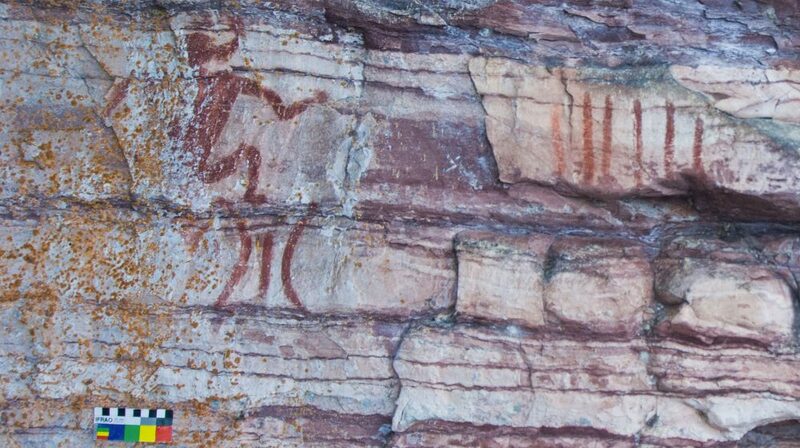 A horned figure (shown at the top right) in a crouching position representing a Manitou or a medicine man. 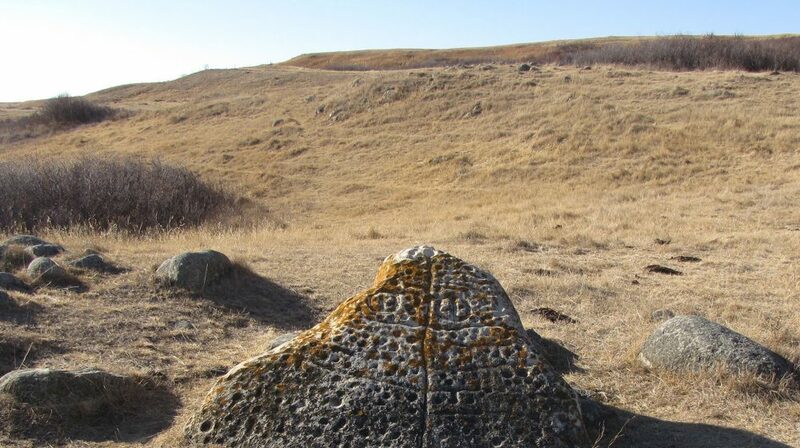 Herschel Monolith, Saskatchewan. A glacial erratic whose surface has many more or less deep cupules (circular depressions). Rocher à l’Oiseau, Quebec. Fish motif (sturgeon?) 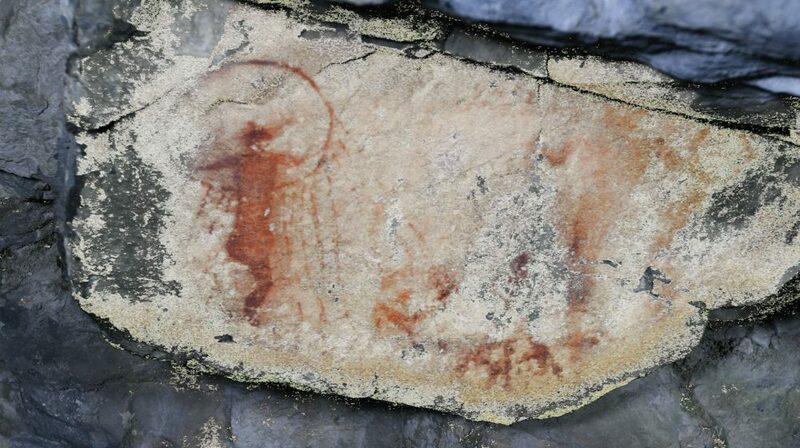 that appears on one of the 77 painted panels at the Rocher à l'Oiseau site in Outaouais, Québec. McGowan Lake, Nova Scotia. 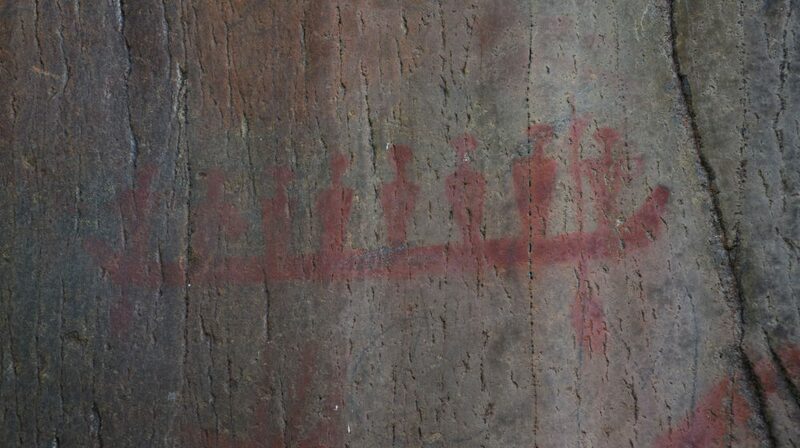 Carving of a hunting scene where a Mi'gmaq man, smoking a pipe and wearing a hat, sends two dogs to hunt moose. Ribstones near Viking, Alberta. 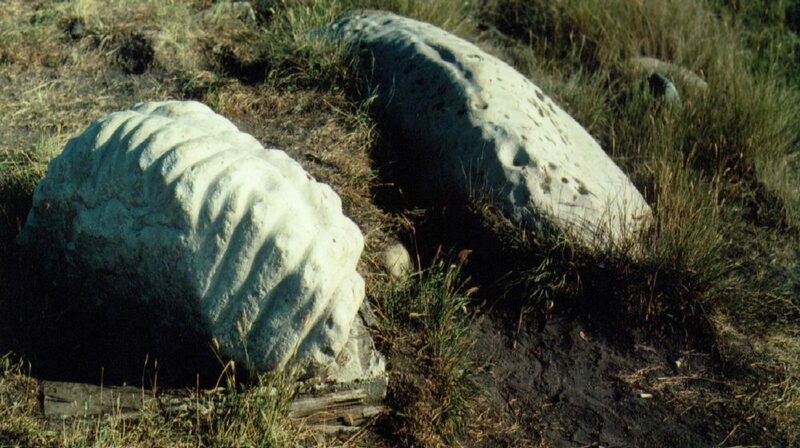 Rocks that evoke bison’s spine and ribs. Reindeer Lake, Saskatchewan. 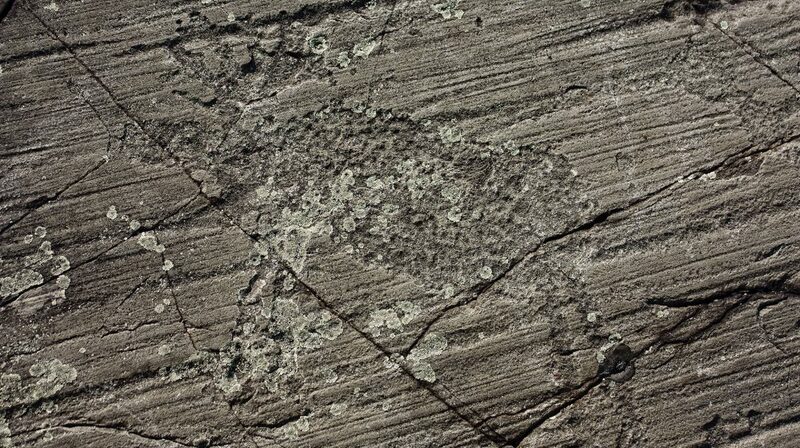 A lichenoglyph of a Thunderbird depicted on a rock. Pictured Lake, Ontario. 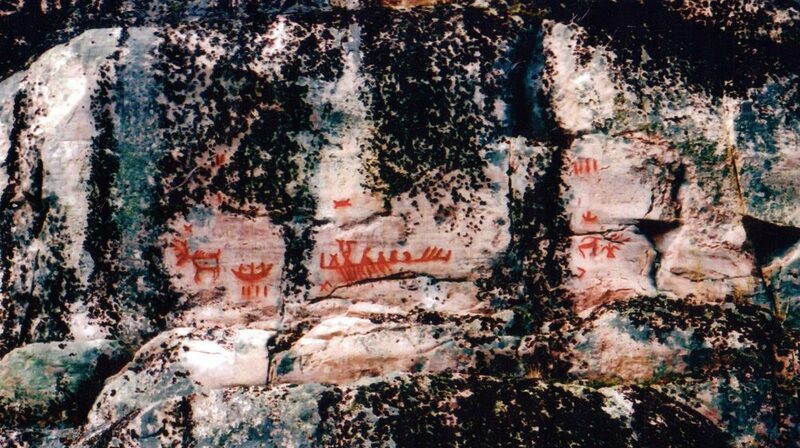 This remarkable rock painting of a canoe with eight occupants, two of which hold paddles, served as a logo for the Canadian Rock Art Research Associates (CRARA) that promulgated the research and conservation of Canadian rock art. Paimusk Creek, Manitoba. 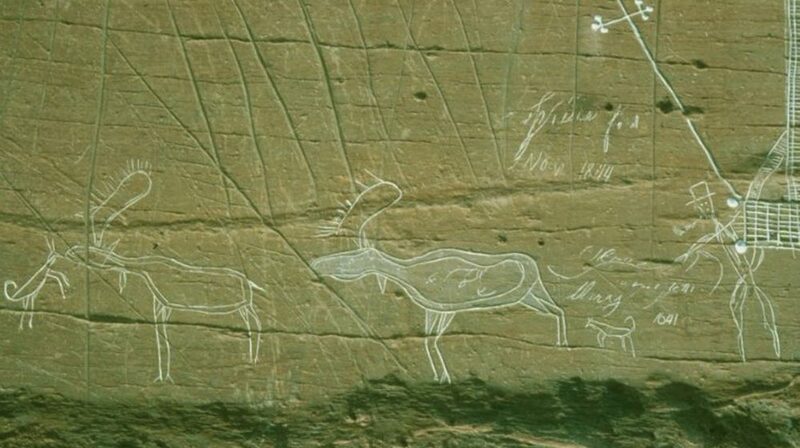 Several vivid rock paintings are part of this detailed panel, including a caribou or a moose, a canoe with three occupants, a Thunderbird, as well as more or less complex geometric motifs. Mystic Cave, Alberta. Representation of what might be a squatting square-bodied anthropomorph and feathered staffs. Bloodvein River, Ontario. 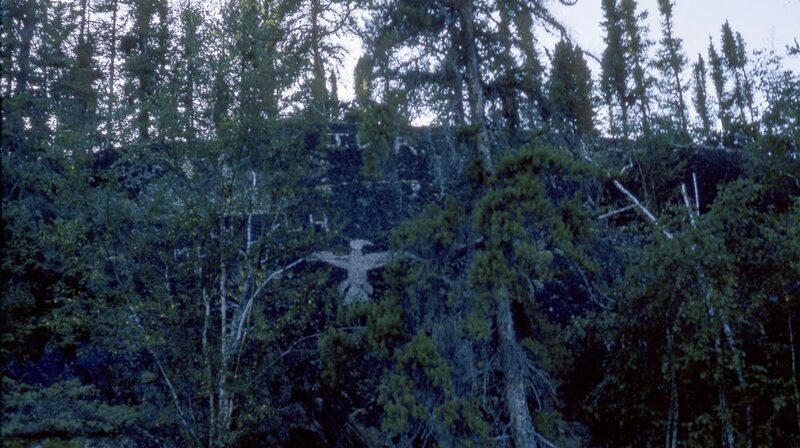 This site located between Lakes Murdock and Larus contains several images, including an anthropomorph that holds in its hand a smaller being, canoes and handprints. Mikinak, Quebec. 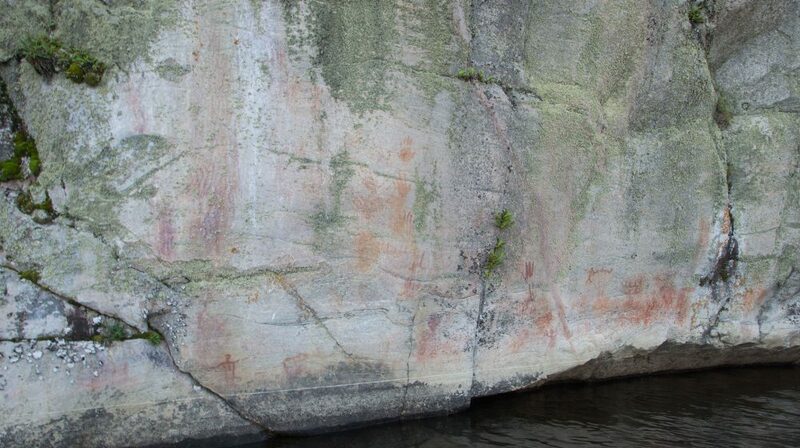 Rock paintings on Lake Wapizagonke, Québec, representing a triangle and a turtle. McGowan Lake, Nova Scotia. 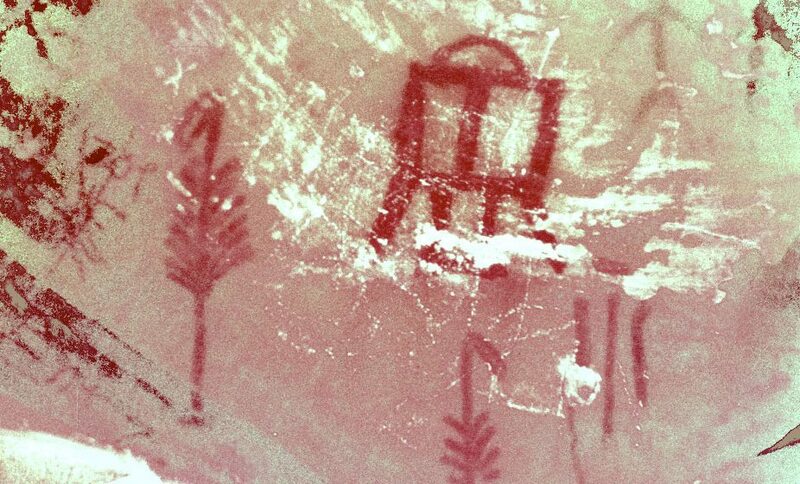 This rich palimpsest of images includes a woman riding a moose turned into a horse, a ship, and several human figures dressed in 19th century Mi'gmaq clothing. Artery Lake, Ontario. 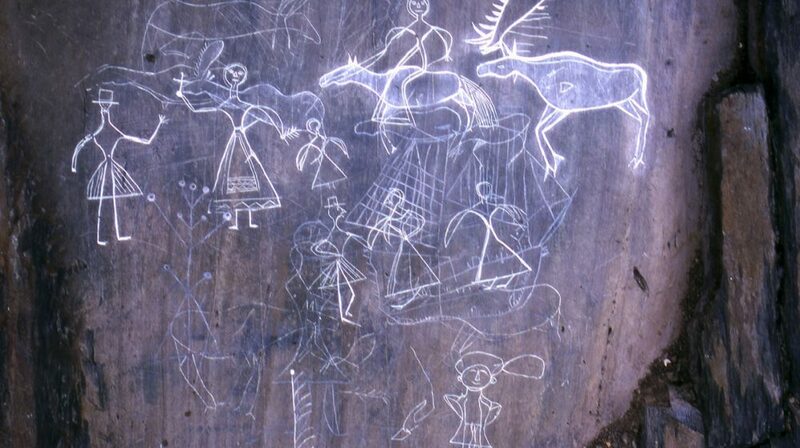 Rock paintings depicting, among others, a medicine man with a bag, a canoe and a bison. Nanaimo, British Columbia. 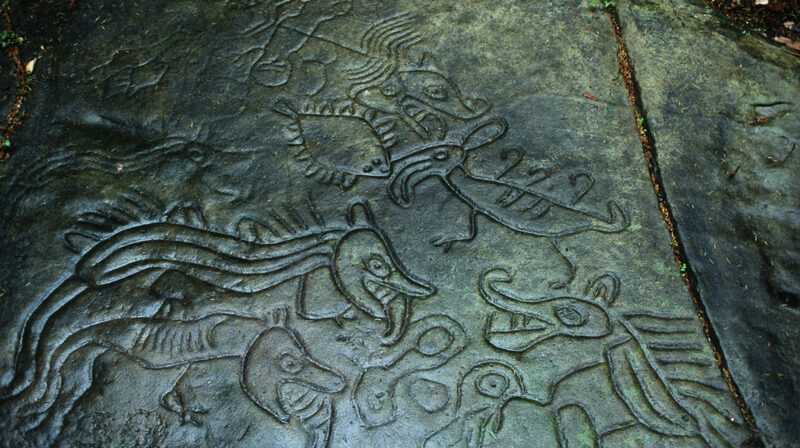 Located in the Petroglyph Provincial Park, near the city of Nanaimo, these carvings represent hybrids reminiscent of the K'aka'win site.